The next time you're in a bookstore, do yourself a favor and find this. What's it about? 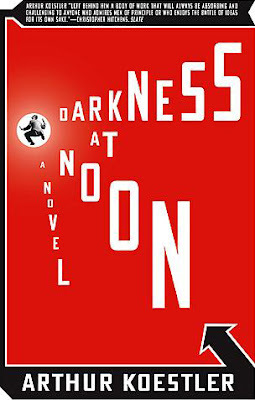 "Originally published in 1941, Arthur Koestler's modern masterpiece, Darkness At Noon, is a powerful and haunting portrait of a Communist revolutionary caught in the vicious fray of the Moscow show trials of the late 1930s." The back, BTW, is equally impressive. oops, didn't read the line that mentioned Sahre. I read this book years ago. I think what inspired me to read it was an interview I read with Sting where he mentioned reading it and being inspired by it. "The Ghost In The Machine" is also an excellent read by Koestler...and the inpsiration behind the Police album. I like that the type treatment is also given to "A NOVEL" but wish that, in that instance, the letter size had just grown progressively. The size jumble on "A NOVEL"is drawing too much attention to the wrong information. That cover makes me feel like I'm falling.